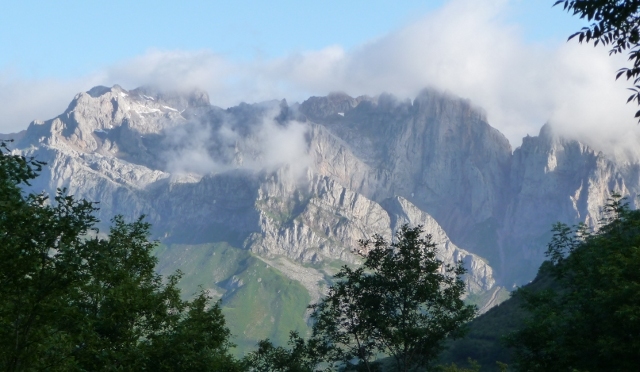 The Picos aren’t big – the whole national park is only about 40km by 40km, and they aren’t exactly stand-alone, running almost seamlessly into the Cordilla Cantabrica range on one side and the Basque mountains heading towards the Pyrenees on the other. But… wow. We spent a couple of nights in the Picos, one at Fuente De (apparently, there was some debate as to whether it should be Fuente de Deva or Fuente de Eva, so both sides agreed to differ and they just called it Fuente De, or “Source Of”). This isn’t so much a village, as the end of the road. Potes, main town on that side of the Picos, has a junction with a side road heading 25km off into the hills. Where that ends, there’s a Parador hotel, a cable car, and a camp site – except that’s up past the end of the road, down a dirt track, over a brow, through a gate… As you can imagine, it’s quite well situated… Unfortunately, the mountains themselves were being a bit coy, and playing peek-a-boo through low cloud cover. The campsite was quiet and idyllic run by a friendly mountain man and his beautiful ‘cloud’ dogs, the site also hosted a ‘refugio’ for walkers in a lovely multi-level stone cabin. The following morning, we had a bit of a wander through Potes – surprisingly un-touristy, with none of the chainstore outdoor megastore and jumper emporium feel that you’d expect in a similar town in the UK. Instead, it just felt local. Sure, there were places to get proper walking boots and high-tech clothing, and the ubiquitous naff t-shirts and tat, but they were subtler. Then up and over a 1650m pass to the other side of the Picos. The way up the pass was wreathed in thick cloud, to the point that at one stage a pair of oncoming headlights suddenly turned into a large roadworks truck… Once we crossed the top of the pass, though, it cleared. Totally. Almost instantly. Blue sky and amazing vistas were revealed. A few more passes later, we found ourselves on the way pausing on a precarious but wider bit of lane for lunch, watching one of the many birds of prey circle lazily round. We’ve been surprised by just how many we’ve seen, all the way down through France and Spain – but this was one big bird. Obviously, we’re used to seeing the Red Kites common in the Chilterns, and are almost becoming inured to the many hawks and eagles we’ve been seeing – but this was a Griffon Vulture with a tremendous wingspan. Ten minutes later, binoculars firmly glued to our faces, we finally lost him. On, round ever steeper and narrower roads, with the brakes on the van making their presence known through ever stronger smells, until we reached Cain, at the head of the Cares Gorge. We didn’t walk the entire gorge, just a small section – but the sheer rock faces either side provided some real drama and the path cut through rock tunnels dripping with water. Goats bounded around, grazing up trees and without the vaguest concept of gravity, adding comedy value. The second night’s campsite at Santa Marina de Valdeón was equally tranquil and surrounded by green hills and overcast when we arrived. 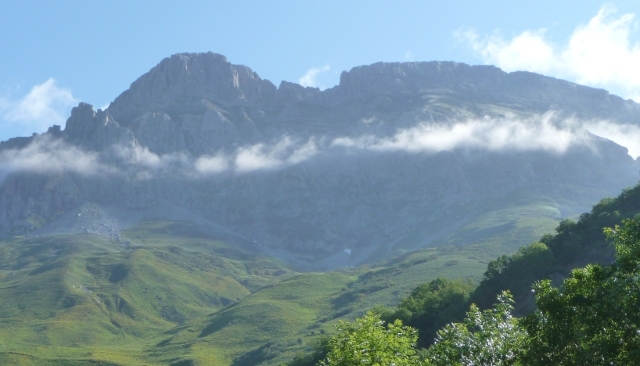 We woke to bright sunshine and tremendous views of the Picos – the green hills of the previous evening clear of cloud revealed breathtakingly beautiful mountains in the photos included here. Sitting in the sun with strawberries for breakfast just gazing at these views – this is what this trip is about! This entry was posted in By Country - Spain, Travel stuff, Wildlife stuff. Bookmark the permalink. Hey you wandering pair. Just flicking through your trail book and am so happy and hopeful that there is life outside of the 9 to 5 wage slave existence. You are living the dream. Ups and downs of itinerant life. Never knowing what’s round the corner and all those images and stories already. Can’t wait for next update.